The lack of hurricane awareness and preparation are common threads among all major hurricane disasters. Protect your home and family with Pittsburgh Corning’s Hurricane/Impact Glass Block Windows. Glass block manufacturer, Pittsburgh Corning, is kicking off the 2013 hurricane season officially beginning June 1 by helping prepare storm weathered residents during Hurricane Preparedness Week May 26- June 1. Meteorologists are predicting an upcoming active storm season, with 16 storms expected to form in the Atlantic, with 8 of those being hurricanes according to AccuWeather. Pittsburgh Corning is urging families to be ready for a storm before it approaches with their Hurricane/Impact Glass Block Windows. Ideal for residential and light commercial applications, the hurricane-resistant windows protect against flying debris and hurricane-force winds, and offers greater security than conventional windows. 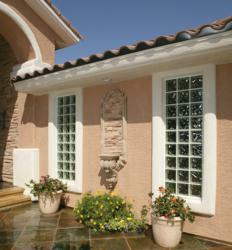 Hurricane/Impact Glass Block Windows are available as a pre-assembled window for easy installation. Pittsburgh Corning’s Hurricane Windows block out the elements while letting in soft, natural light for an enhanced visual space experience. With 60 sizes, three unique design patterns and a range of visibility and privacy options, the hurricane-resistant windows provide beauty, security and peace of mind. For more information on the Hurricane Window and other glass block products that can enhance the beauty and security of a home, visit http://www.pittsburghcorning.com. Pittsburgh Corning is the leading manufacturer of premium glass block products and specialized architectural window systems for commercial, institutional, government and residential buildings. Glass block products are extraordinarily versatile, providing design options and daylighting while keeping people and property safe and secure. Since 1937, Pittsburgh Corning has been on the forefront of innovative applied glass technology, designing products that stand the test of time. Headquartered in Pittsburgh, Pennsylvania, Pittsburgh Corning is an equity affiliate of PPG Industries, Inc. and Corning, Inc.